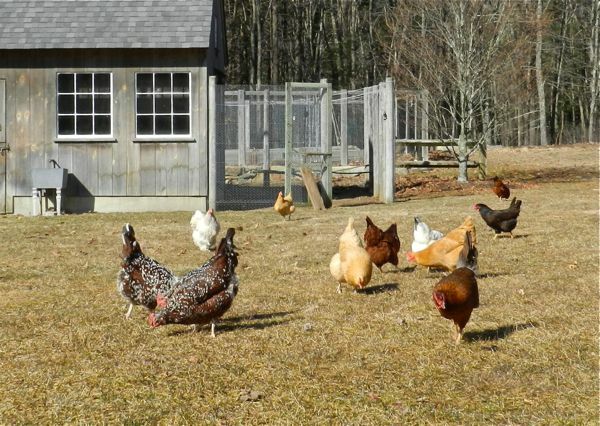 Everyone has heard of the term pecking order, and we all knew, when starting out, that our own flocks will be party to that most basic of chicken behaviors. Still, the beginning chicken keeper is often taken aback at what goes on. Chest thumping, feather pulling, blood letting! It’s not pretty and it doesn’t look nice. In the worst case scenario, a picked on hen will be killed by the others. This happens. Some people ascribe all sorts of bad intentions to the offending “bullies” but in truth the animals are not at fault, for their behavior is due to how we manage their care. It’s up to us to control the flock dynamics to have the best scenario, that of a peaceful, healthy flock where everyone lives amicably together. Pecking order, and as the term implies, is established by using their beaks. But, that does not mean that the hens spend their days attacking each other. A group of chickens should quickly reach an agreement, and each hen will know her status. Status determines who gets the best tidbit and who gets to sleep in the prime spot on the roosts. Think of the pecking order as a resource guarding. 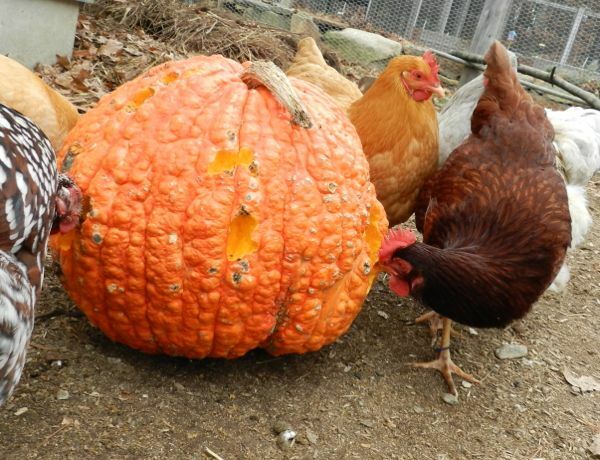 Hens want to keep the best things for themselves and the pecking order determines first dibs. Despite the fact that chickens have no qualms about bossing underlings around, once the pecking order is set the flock should be peaceful with no obvious bullying, and certainly no terrorizing the low status birds into corners or drawing blood! Chicks that grow up together rarely have issues. They’ve figured out who’s on top from early on. As the pullets mature there might be a few spiffs as a hen gets larger and bolder, but there shouldn’t be anything dramatic or bloody. Because, as much as it’s called “pecking order” the hens have all sorts of body language that they use before they have to resort to stabbing each other with their pointy beaks, and the low-status birds are smart enough to get out of the way. It is personality, not size that determines who is on top. I’ve found that the breeds that are the most active foragers and need the most space, such as Barred Rocks, Wyandottes and Rhode Island Reds, tend to be the dominant ones, and the Orpingtons, Cochins and Polish lower down. But, there are always exceptions. My first Bantam White Leghorn, a petite hen, was the queen of the barnyard for years. If you have a flock of hens that know each other well (no new girls coming in) then all should be peaceful. If there are frequent squabbles, or if a hen is getting bloodied, then you have a management issue. The most common reason for pecking order violence is crowding. Each hen needs a minimum of 4 square feet of floor space inside and another 8 outside. Be aware that there are times when the chickens won’t be spread out evenly. 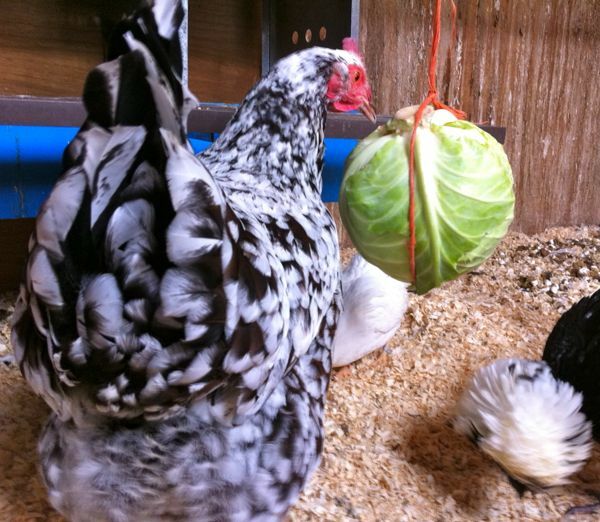 Take a look at your hens’ accomodations during inclement weather. Are they crammed together? If your hens are attacking each other, but have space, then reorganizing the coop can sometimes relieve the pressure. Adding outside roosts can give the lower status hens a place to go, or conversely, a perch from which the high-status hens can survey their realm. It doesn’t matter which, what matters is that the hens can move freely away from each other and have their own places. Chickens are greedy and possessive about food. Hang the feeder so that the hens can circle around it and no one gets trapped in a corner when trying to eat. 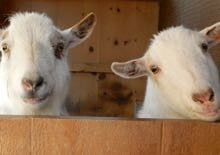 Add a second waterer outside. When providing treats, set them out in several places. and why I’ll toss them clods of dirt and weeds in the summer. It’s rare (it’s only happened once here in 20 years) that you’ll have a hen who is a bully and despite having everything that she needs, goes after the other hens with an unrelenting viciousness. Remove her from the flock for four days. Put her out of sight. 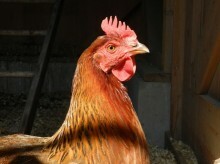 When she is returned she will be at the bottom of the pecking order and she will rarely go back to her aggressive ways. If she does, get rid of her. There are times when the pecking order gets upset. If a hen becomes ill the others will go after her. Chickens recognize each other by their combs, and a change in it’s color (which can happen at the onset of illness before you notice something is wrong) will set them off. 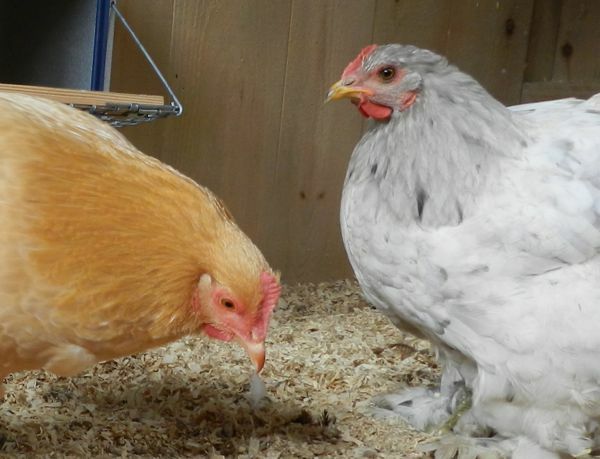 If all of a sudden your flock dynamic has changed, take a look at your hens’ health! If a chicken does become wounded, the red blood will make her a target of the entire flock. If it’s not severe, darken the exposed skin with blu-kore (a purple antiseptic), if it’s open and bloody, remove her from the group until healed. Pecking order is always disturbed when new chickens are introduced. Even if you have only one hen, and think to add a second as a friend you’ll have aggression – just because you like that new chicken doesn’t mean that your hen will immediately bond with her. During a normal bit of sorting out there will be chest thumping and running at each other. This can go on for days, but things should quiet down. It can be especially difficult adding one young pullet to a flock of hens. I have tips on how to merge new hens into an established flock here. Sometimes the attacks seem endless and they can be severe. I’ve seen a hen jump on another’s back to pin her down and fiercely peck at the head. Chickens doing that can kill. Roosters don’t allow this sort of hen on hen attack, and stop it by interrupting the behavior. This is something that you can do, too. Sometimes all it takes is for you to pick up the bully and move her away from the hen that she is focused on. Do this a half-dozen times and she usually gets the message. Don’t you become violent and swat or hit the offending hen. That won’t effectively communicate to her that she needs to cease her attacks. If you aren’t able to stop the bullying, then remove her from the group for a couple of days while the new hens settle in. A flock of hens that all get along is a pleasure to have in the backyard. However, underneath their cheerful clucking, the pecking order is always simmering. If you pay attention to your hens’ behavior, health and resources, it won’t boil over, and you’ll all be happy.